05 Qu'est-Ce Que C'est Que Ca? Pete Shelley (born Peter Campbell McNeish, 17 April 1955 in Leigh, Lancashire) is an English singer, songwriter and guitarist, best known as the leader of Buzzcocks. Homosapien was Buzzcocks frontman Pete Shelley's 1981 debut solo album, the title-track of which was released as a UK single the same year. The single was banned by the BBC, but was nevertheless a hit in several countries. The album began as a collection of studio demos recorded by Shelley (and produced by Martin Rushent) for the next Buzzcocks' album. In the process, Shelley and Rushent grew enormously fond of the sound they had created in the studio, which featured an interesting blend of drum machines, synthesizers and sequencers coupled with guitars. Shelley, weary of the Buzzcocks' financial state, decided to leave the band after Island Records' Andrew Lauder offered him a solo record deal based on the demos. Released at the start of the home computer boom, the album cover featured Shelley in a stylised 'office' leaning on a Commodore PET computer. 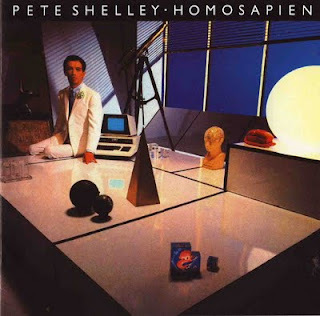 As was typical in the era, Homosapien had a different track listing in the United States, with three songs being excised and three single b-sides being added in their place. In 1997, Razor & Tie Entertainment reissued the US version on CD with five bonus tracks taken from Shelley's follow-up album, XL1. In 2006, the original UK version was reissued on CD by Varep Records. It includes all the songs from the US version as bonus tracks, as well as two other b-side "dub" mixes.